Note: Baxter State Park is over 200,000 square acres of protected wilderness, rolling 18 miles northwest of the welcoming country-town of Millinocket, Maine. 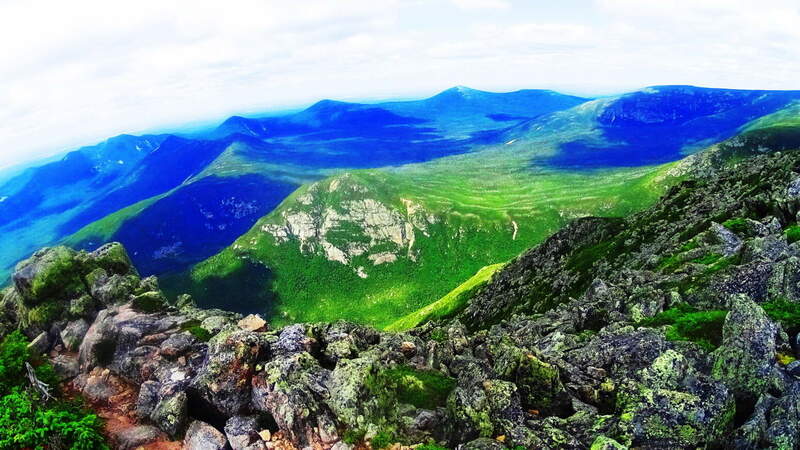 The crowning feature of this incredible old-growth preserve is Mount Katahdin, a 5,267 foot peak, and final mountain along the American northeast’s 1,500 mile Appalachian Trail. 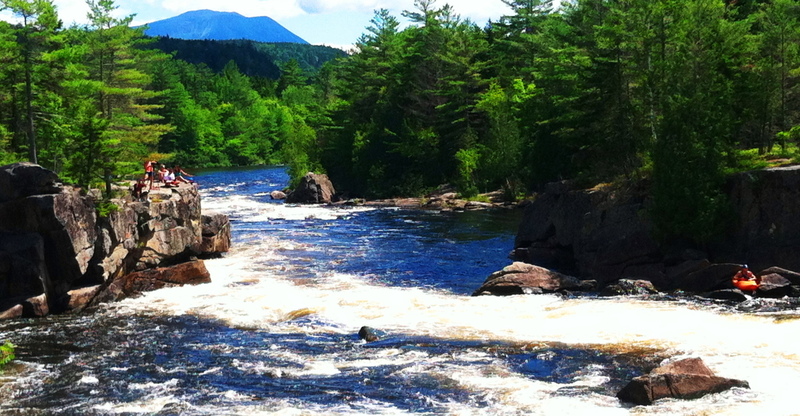 The Piscataquis and Penobscot Rivers cut through the southeasterly portion of the park, creating opportunities for riding rapids and hiking along waterfalls, all with Mount Katahdin looming stoically in the background. 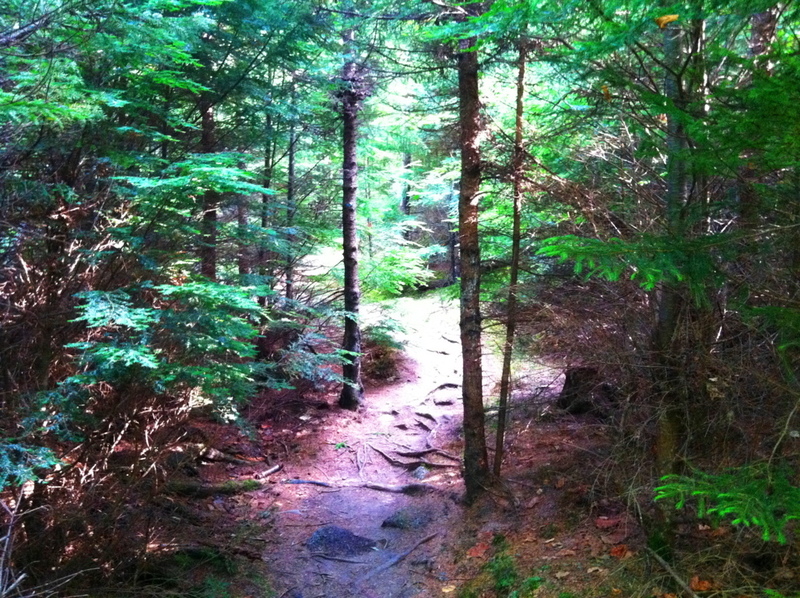 Dozens of trails are spread throughout the park. 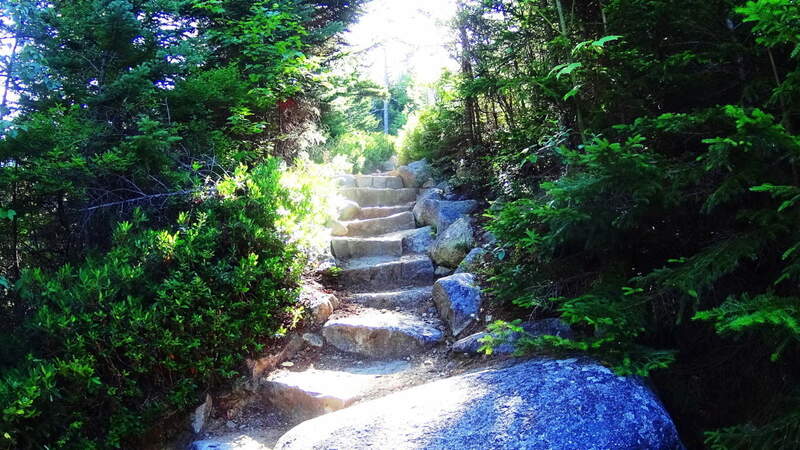 “Hunt Trail” is the official Appalachian pathway to the alpine peak of Katahdin. Other trails that run to the peak, such as “Knives Edge”, “Abol”, “Cathedral”, and several others, require a reservation with the park before arrival, which can be made easily on-line at: http://www.baxterstateparkauthority.com/reservation/ The trails here also offer a good deal of anthropological mystery, with megalithic stones in patterns and shapes that push the envelope of our imaginations. I hope people understand that this is a site about fully appreciating what is discovered on wildlife pathways, and it is not meant to be shocking or offensive in any way. 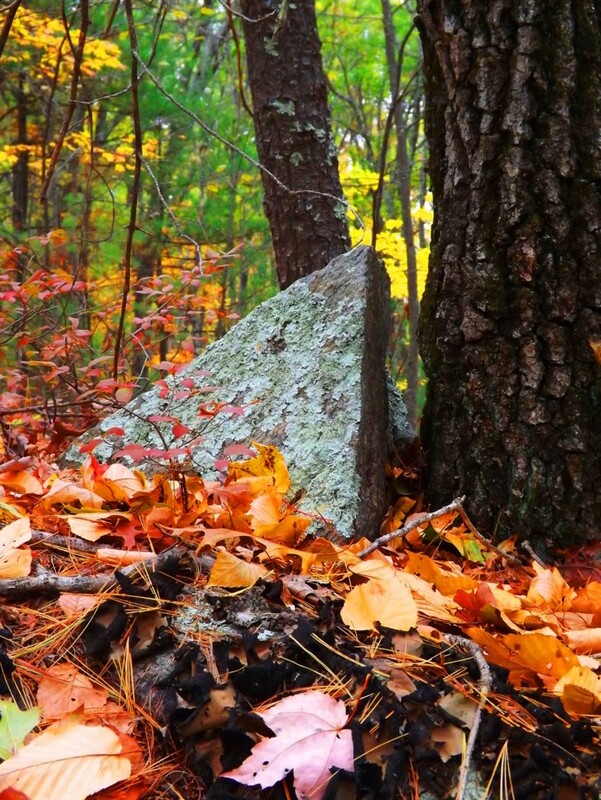 The information and evidence in the forests of New England support a megalithic culture that had specific memes and themes cut into granite, all for the world to discover. These mysterious stones can be found on Hurd’s Pond Trail, and I hope people visit these woods and judge for themselves what is being described here. 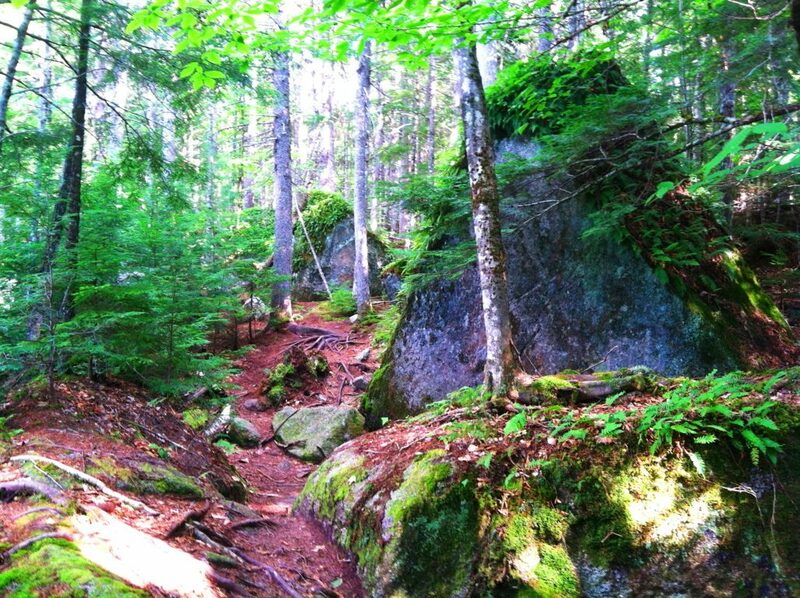 Trails which are not at an immediate proximity to Katahdin will NOT require a reservation, such as trails that run along the rivers, old-growth forests, lakes, rocky ledges, and icy caves, several miles to the south. Hurd’s Pond Trail: “Hurd’s Pond Trail” will take you through some pretty cool natural features, and picturesque pathways, with several points along the way that give wonderful pause, and appreciation. The Abol-Bridge Campground site is the jumping-off point for this trail, which runs the east-to-west course of the main road of the Reserve, Golden Road. The Northeast Piscataquis River runs south from Abol Bridge, with a dirt road running along its edge, eventually veering southwest into the forest trail. You can choose to walk the 3.5 miles along this stretch of scenic river-road to arrive at the car park of “Hurd’s Pond Trail”, or you can simply drive to the car park, which will be on your right after the 3.5 miles. 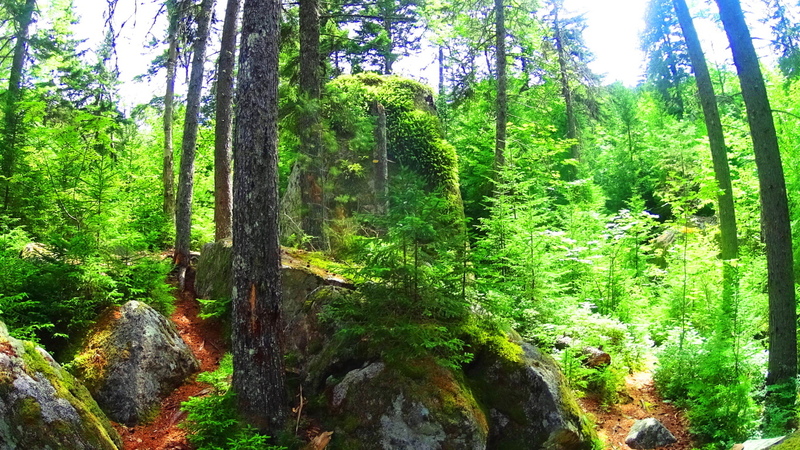 Hurd’s Pond Trail is a relatively short hike on it’s own, of about 2.5 miles culminating at the “Ice Caves”, an enticing network of boulders and passages overlooking Debsconeag Lake to the south. Before you get there you pass a set of pathways that feature different types of ledges, hedges, glades, and anthropologically mysterious megaliths. 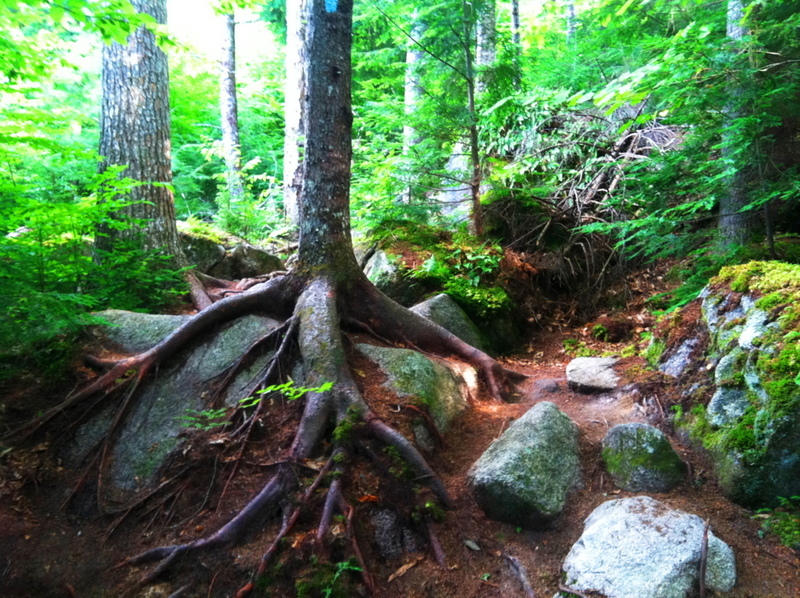 The lower trail runs over thousands of roots, and passes around grand fixtures of boulders that look to have been placed specifically along this particular part of the forest. 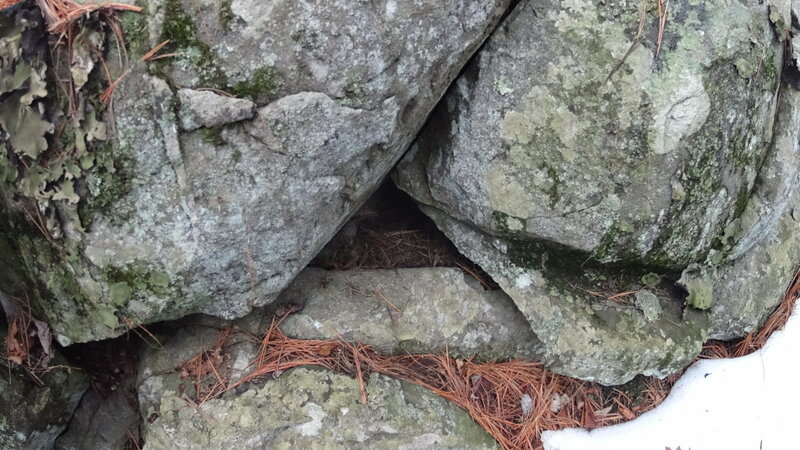 Take a look at this boulder pictured below; do you notice anything particular about it? 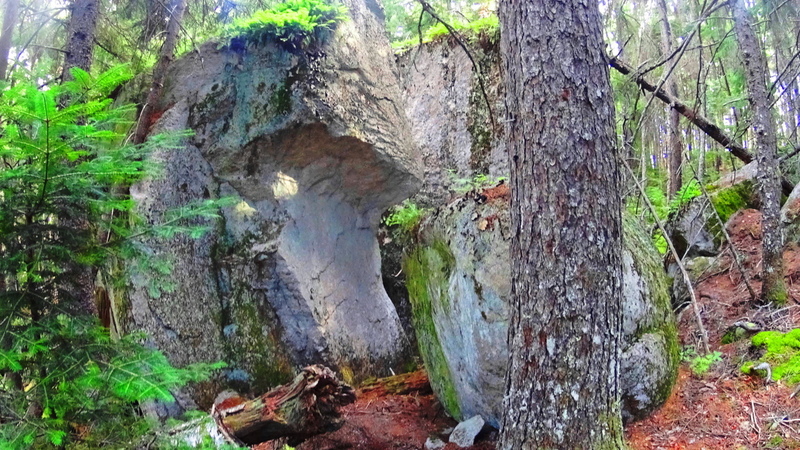 To answer the question: there are half-a-dozen massive triangular boulders, cut with a flat face and rounded back, standing at about 10 feet in height, and perhaps 20 tons in weight, along the path to the Ice Caves. It’s astonishing. There is first one triangular boulder to the right, and then one triangular boulder to the left, and then another to the right again, all within the first half mile of the hike. It is hard for me to believe that seasoned hikers and naturalists simply pass by this without taking any note of it whatsoever? Personally, it is impossible for me not to stop and wonder what this might indicate. Take a look at the image below; how could you ignore this? These are teams of similarly crafted boulders, staring you right in the face. Not only are they similarly crafted, but they are facing the exact same direction, north, which is staring directly at Mount Katahdin. 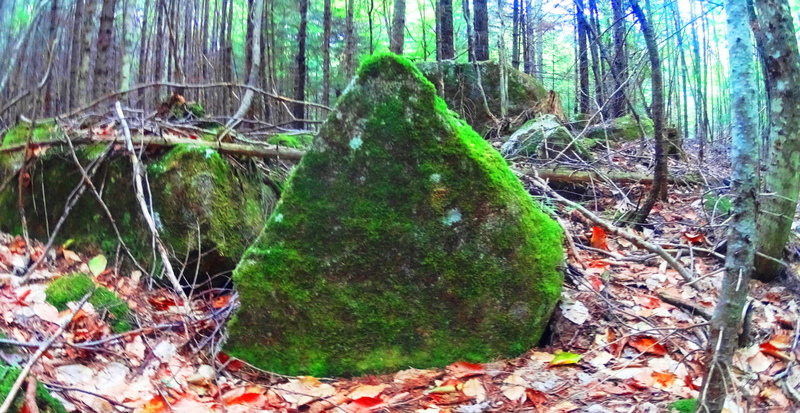 If it were not for the amount of clearly crafted triangular stones that I have time-and-time-again found in various forests of New England, I would have a hard time writing this portion of the blog. 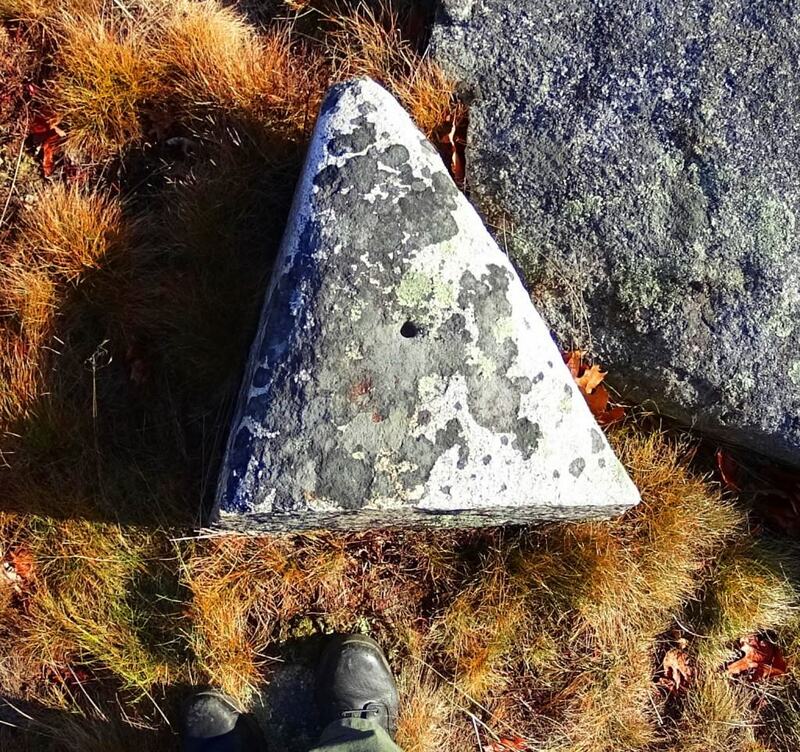 I completely understand that some people may be entirely skeptical of this, but at this point it is utterly obvious to me that the equilateral triangle was worshiped by a megalithic culture in the forests of New England. 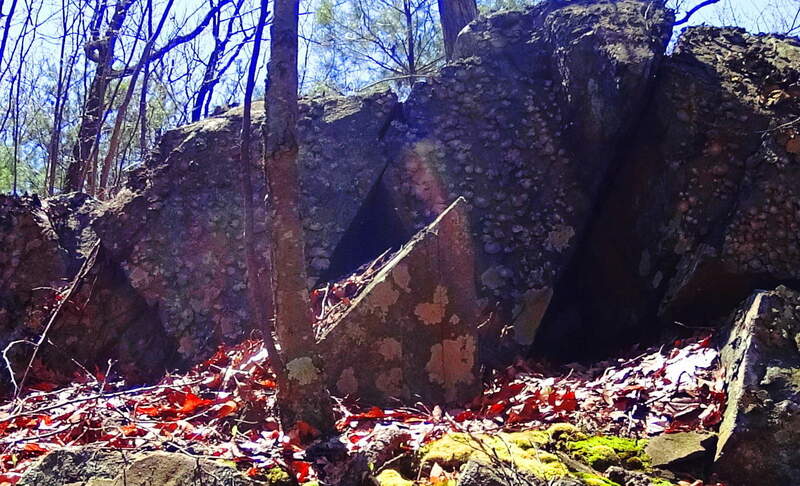 To support this, just take a look at some of the examples of granite-cut triangles discovered from places all over New England, found in hard to reach places like significant mountain elevations, waterfall facades, and deep woods ridges, miles from modernity in every direction. Please consider, that scientifically speaking, Equilateral Triangles DO NOT OCCUR IN NATURE. These shapes were obviously crafted. Something is going on with the Triangle in antiquity, and anthropologists are simply choosing to totally, and absolutely, ignore it. There is more to add to the mysterious elements at Hurd’s Pond Trail. 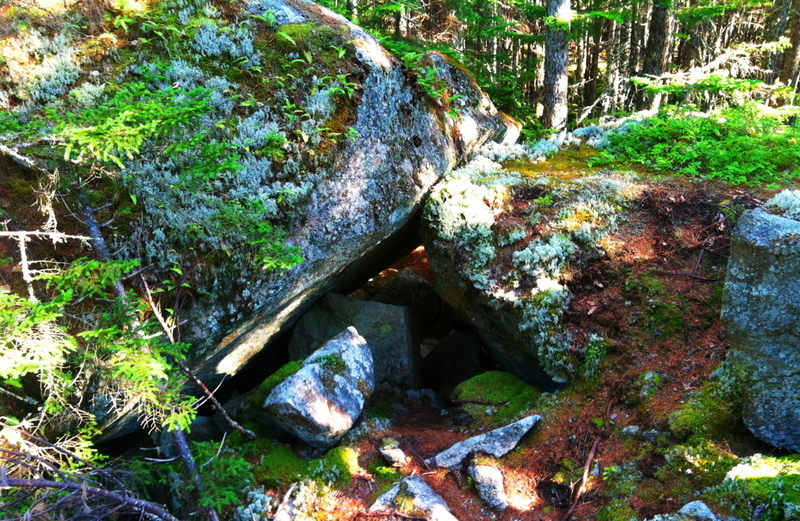 Once you pass the initial triangular megaliths, you will come to groupings of boulders deeper into the woods that have other compelling features. You will first drift through some heavy hedges and narrow lanes, and come out to a beautiful glade of 100 foot tall Pines. 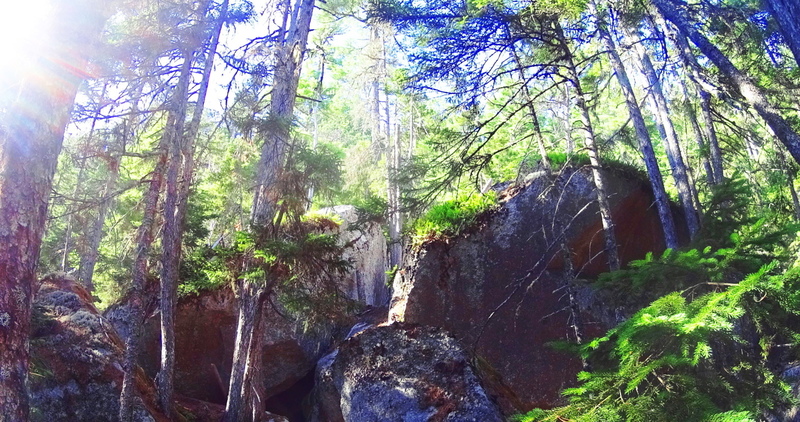 The boulders under these pines have specifically fitted cuts, within the rock faces themselves, which are angled and overlapped to create a triangular feature. 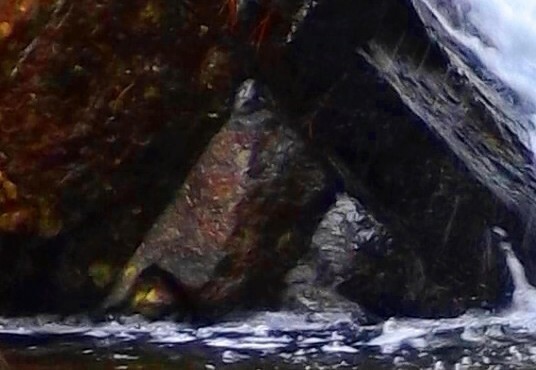 In the image below, these two boulders are not sitting at random; the left boulder has a level right-face that is meshed in a perfectly flush fit to the cut-and-leveled left side of the boulder on the right. If you look closely it is absolutely clear. 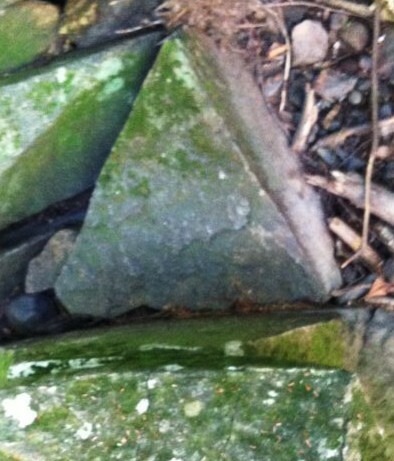 This ‘flush overlapping’ of the stone creates a specifically triangular space beneath. 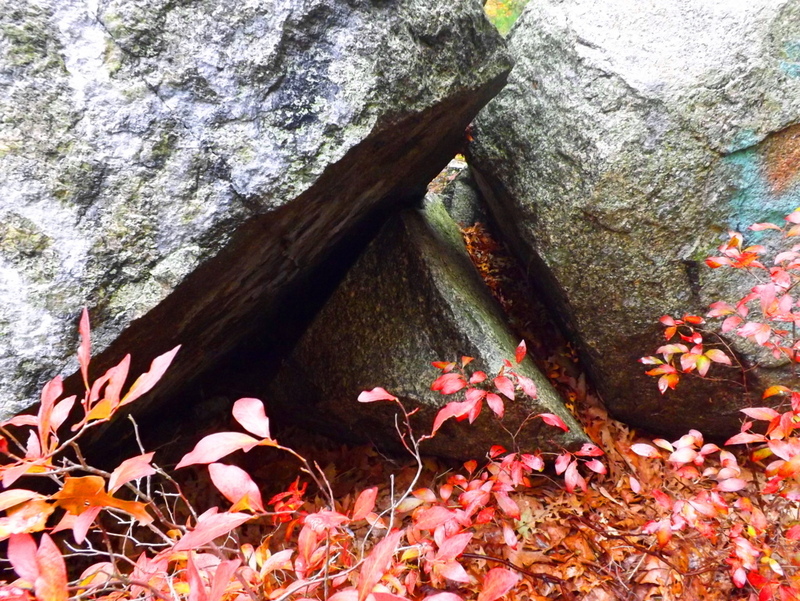 Take a look at some more examples from New England forests where I’ve found flush-fitted overlapping boulders that create triangular spaces. It’s not simply the triangular space beneath the rock, but it is the exact precision of the continued lines which create these angles that amazes me. How this is possible is hard to comprehend, and yet it is there. After passing a few hillsides with beautiful trees you will come to the sign that points to the Ice Caves, which do not have ice in late July. There is a railing and ladder that you can climb down into the caves, with its shafts of shadow, wind, and light. Above the Ice Cave boulders is a view of the beautiful Debsconeag Lake to the south. 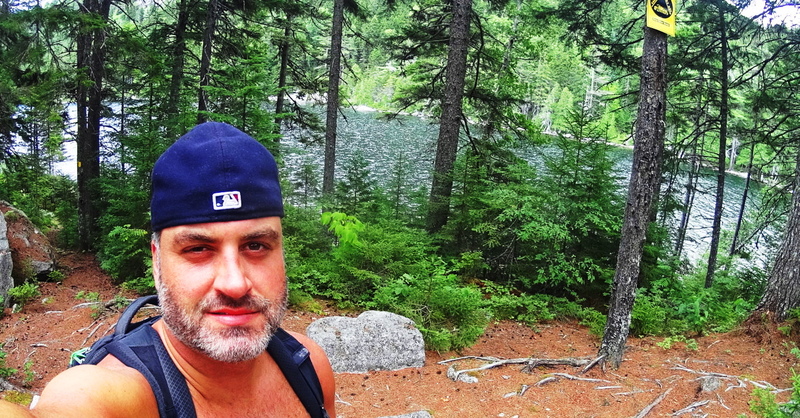 At this point you will have completed one of the better introductory trails to a worthy wildlife preserve in Baxter State Park. Work your way back steadily to the car park, and make sure you give yourself enough time to return before the Sun goes down. 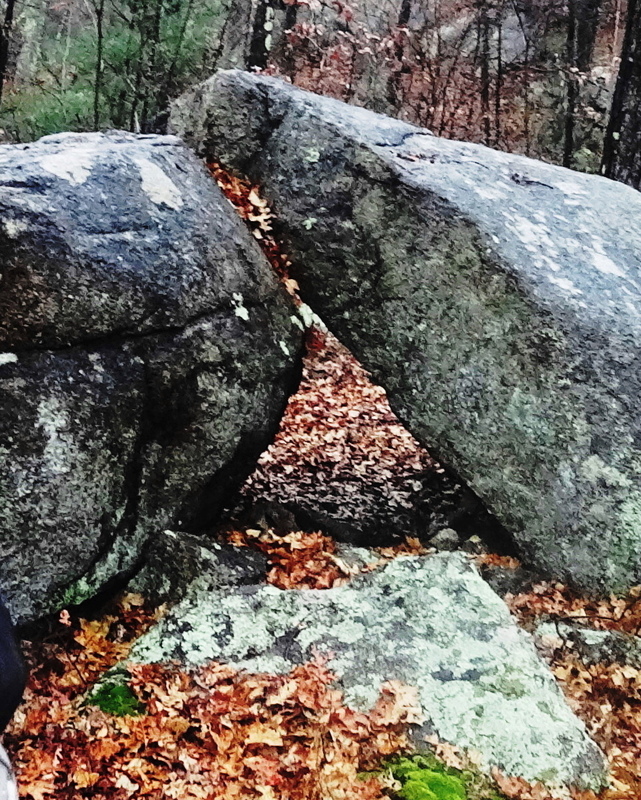 Final Note: New England is home to one of the most mysterious megalithic cultures in the world, which is obviously supported here at Stonestrider.com. This culture is very similar to the Celtic megalithic culture, which of course also has its own beautiful massive stone statements from the earliest era in History. 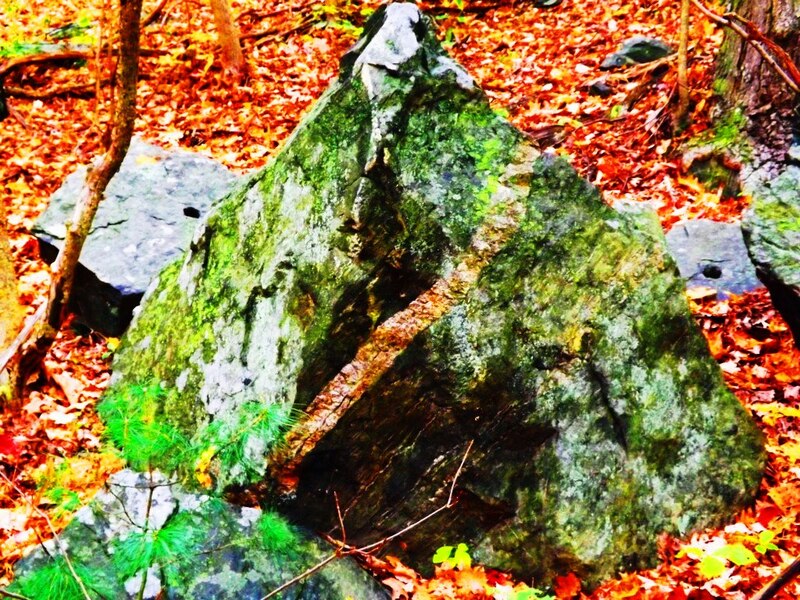 Supported by consistent evidence, the megaliths of New England obviously have their own specific memes; rather than Celtic “spirals”, New England offers us ‘triangles’ cut out of, and into, the stones. I hope people come to understand the anthropological significance of this statement, and that every culture in the world seems to support a megalithic era, with distinct evidence. 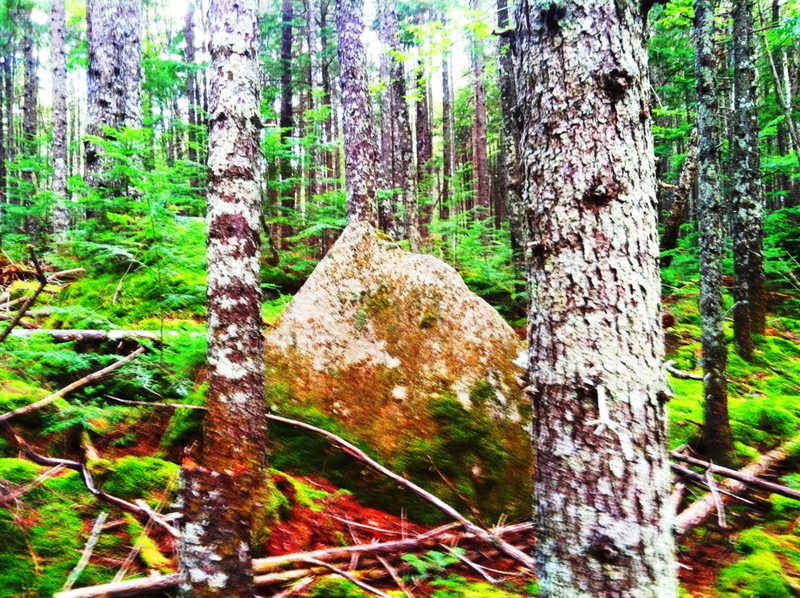 Baxter State Park is one of these sacred places, with natural beauty in the landscape, epic grandeur in the mountains, and mysterious megalithic statements deep within the forests. It is everything that this website hopes to bring to the foray. Do not to take my word for it, but seek and find these sacred places for yourself. 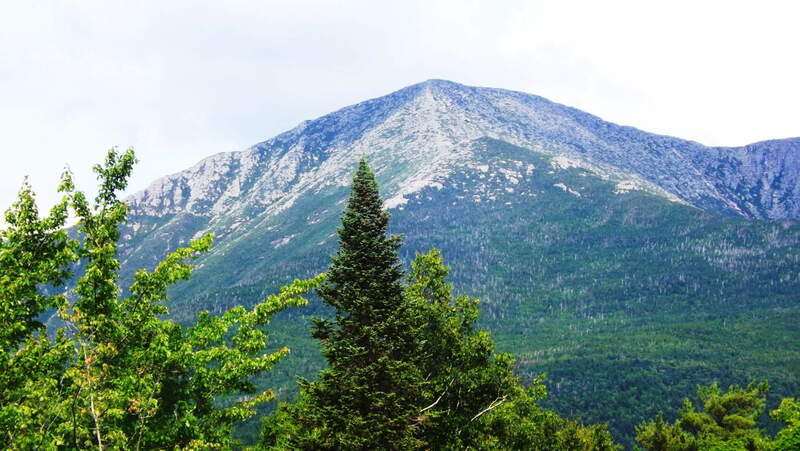 Note: The Penobscot Native-American tribe that once lived in this region referred to this mountain as “Katahdin”, which means: “The Greatest Mountain”. 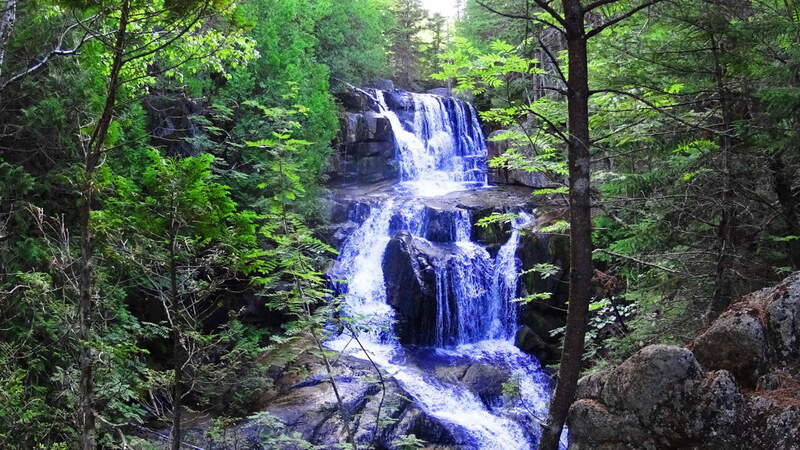 It’s expansive natural reserve is protected by the State of Maine as Baxter State Park, inclusive of incredible rivers, rapids, high mountain streams, and cascading waterfalls cutting through one-hundred miles of Appalachian forest. 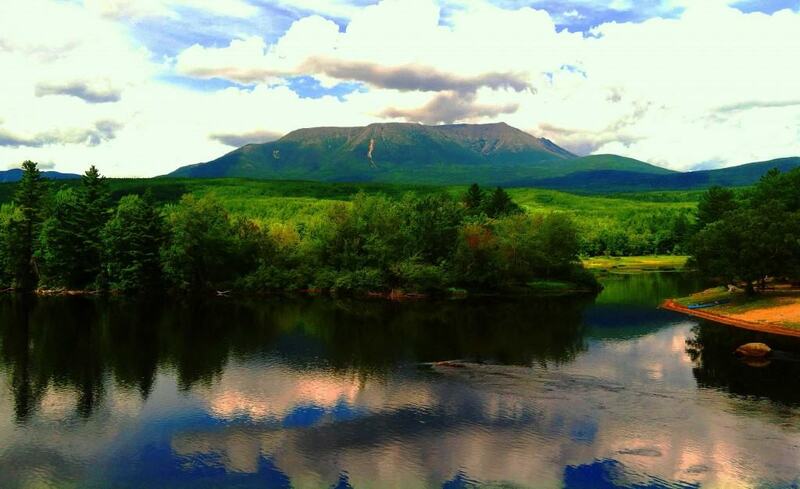 Hiking Katahdin is a multidimensional experience with marvelous variations in the fauna and stone while ascending. I followed the ‘Katahdin Stream Trail’ on the western face of the mountain, which requires a parking reservation and 7 a.m arrival time, easily made through Baxter State Park Office. 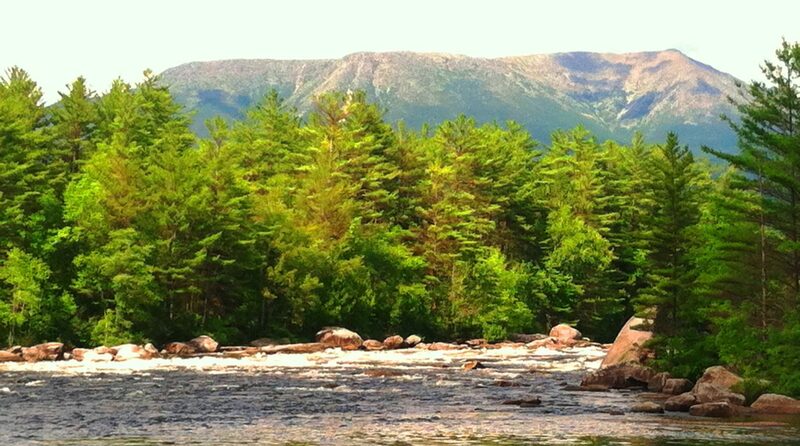 The initial portion of ‘Katahdin Stream Trail’ follows a beautiful and wide rocky stream, with grand free-standing boulders guiding the water that rushes down the mountain. Ancient works of masonry appear in unique stone pathways fully enclosed by beautiful Pines and Birches. Some steps are refined and delicately thin, while others are wide and loosely fit, with blatant cuts and incisions, a full half-mile above ground level. A spectacular waterfall can be found about an hour into the hike. The necessary level of skill increases after the waterfall, where the trail mingles with dried stream-beds and stacked boulders. From here, branches and roots surround the trail increasingly, and it is necessary to begin using climbing techniques. The terrain continues in this way for roughly another hour before breaking the tree-line, and encountering another major challenge. Above and beyond the tree’s is a venerable wonderland of massive rocks and boulders, lining the last ledge to the peak like a giant’s pathway. Free-climbing is required in order to work steadily along the massive ridge, weaving between and over colossal boulders sitting almost a mile above the world. To both the left and right of the boulder-trail the valleys below unfold like a brilliant blanket with peaks to the edge of the skyline. The pine trees below undulate and sparkle with a static electricity when the Sun is shinning, and all of New England unfolds before you. Steadily climb through the boulder-trail following the white-dot markers, and it is roughly 45 minutes to an amazing peak. 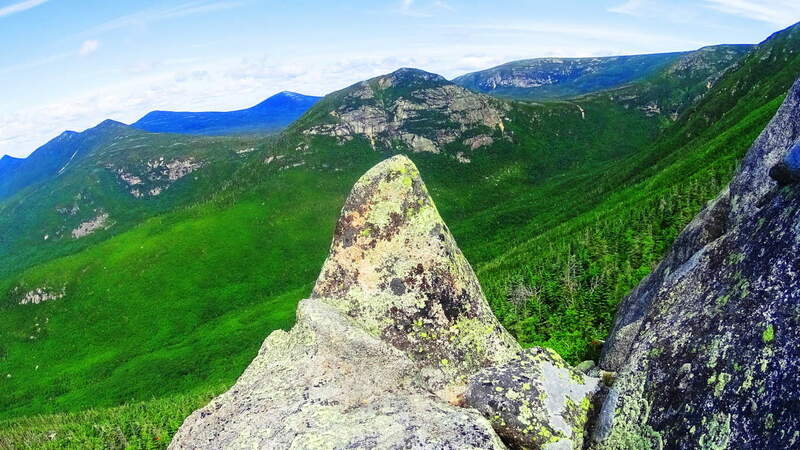 The Katahdin peak is a magical collage of unique dark granite colors combined with Celtic looking green moss, and interlocking stones. There are anthropologically notable standing-stones unlike any I have ever seen on this enchanted plateau, pointing and aligning to peaks to the west and east. Some standing stones include signature fixtures, such as miniature counterparts supporting the front facade and drawing attention to the work. 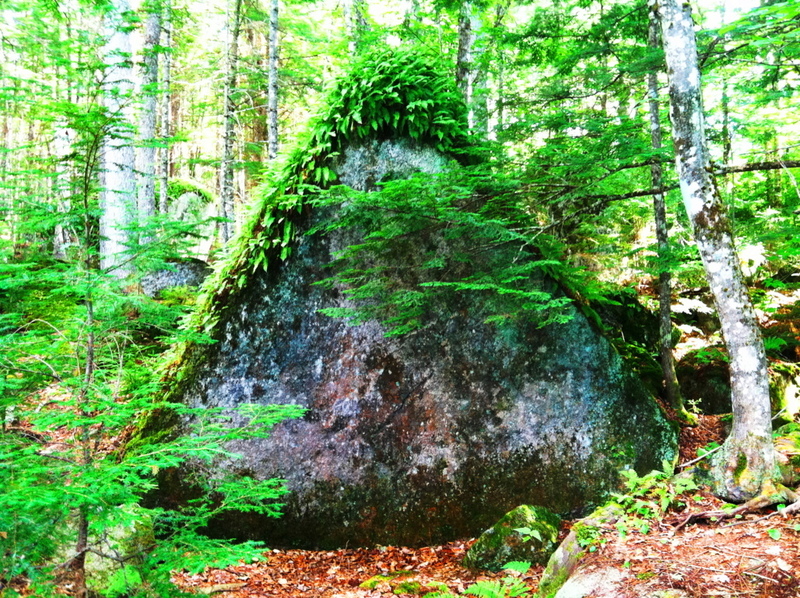 The entire elevation is covered in this unique moss so similar to the heights in the Mourne Mountains of Ireland, the Cornwall coast of England, and gritty heights of Glencoe Scotland. 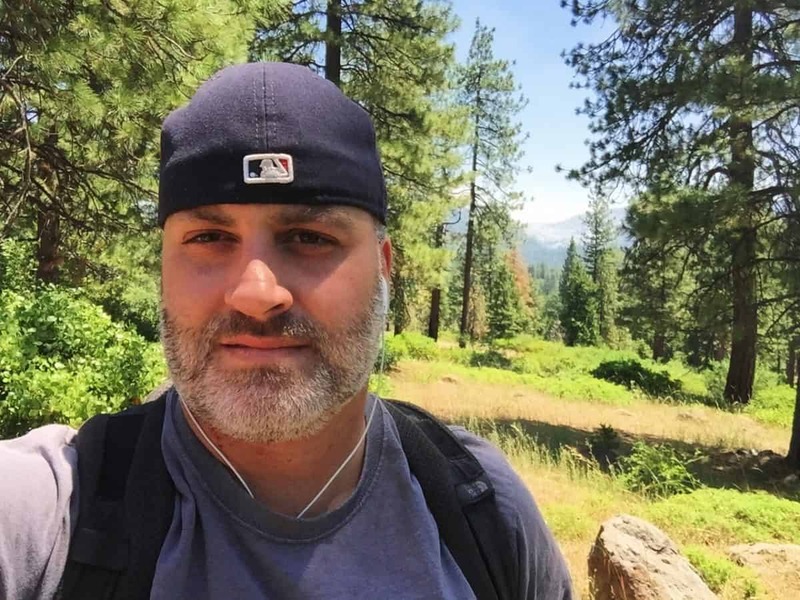 This is one of the best hiking experiences in all of New England, and should be experienced by all sincere nature lovers and ancient culture enthusiasts.